Learn about upcoming U.S. and world coin collector shows, expos and other collecting events, including numismatic auctions — both in rare coins and currency. For the latest information on what’s happening today in the hobby community, check out the following coin news articles. 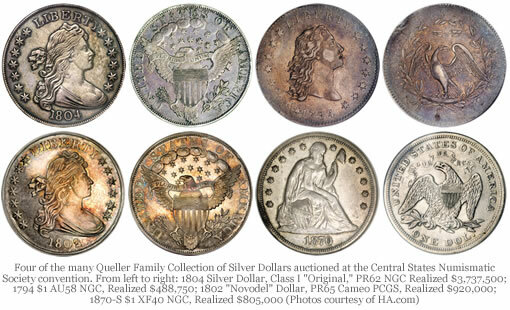 IRVINE, Calif. – Bowers and Merena, America’s leading rare coin and currency auction house, realized an impressive $5.9 million with its 1,000-lot Chicago Rarities Sale. The auction was conducted in a single session on April 15, 2008, with Internet bidding taking place prior to the sale through the Bowers and Merena website, www.bowersandmerena.com. “We are very pleased with the excellent results achieved by this sale,” stated Bowers and Merena president Steve Deeds. “It is an honor for us to be trusted with the sale of such important numismatic rarities in a dynamic market. My heartfelt thanks goes out to all of our consignors without whose support we could not maintain Bowers and Merena’s position as America’s preeminent numismatic auctioneer. An impressive selection of Buffalo Nickel rarities led the way in prices realized for this sale. Dallas, TX. The 1804 Silver Dollar highlighting the amazing collection of silver dollars assembled by David Queller and his family reached $3,737,500 at the Official Auction of the Central States Numismatic Society convention held by Heritage Auction Galleries. Combining the rare coin and currency results, total prices realized currently exceed $42.6 million. After adding proceeds from all Post Auction Buys and Final Session auctions, total prices are expected to exceed $44 million. More than 6,700 bidders participated in the Signature and Platinum Night events, and another 3,000-plus are anticipated to participate in the Final Sessions. The auctions were held in Rosemont, Illinois on April 16-18; Images, descriptions, and prices realized for all lots can be viewed at the Heritage website, HA.com. An online auction of ancient coins will be held in August 2008 to raise funds for ACCG legal initiatives in opposition to the State Department imposed import restrictions on ancient coins. An Ancient Coin Collectors Guild (ACCG) benefit auction is currently being organized to raise funds for anticipated legal expenses in opposition to State Department imposed import restrictions on ancient coins. The online sale, closing on August 17, 2008, will be hosted on the Vauction site as a fund raiser for anticipated legal expenses. Individuals wishing to donate coins for this sale may contact Wayne G. Sayles, ACCG Executive Director by telephone at 417-679-2142 or by email at director@accg.us for details. A goal of 150 lots has been established and some exceptional coins have already been pledged. All donations are welcome. Coins of lesser grade or value may be combined into multiple coin lots. All donations should be arranged as early as possible, but not later than June 15, 2008 in order to provide time for proper cataloging and processing.